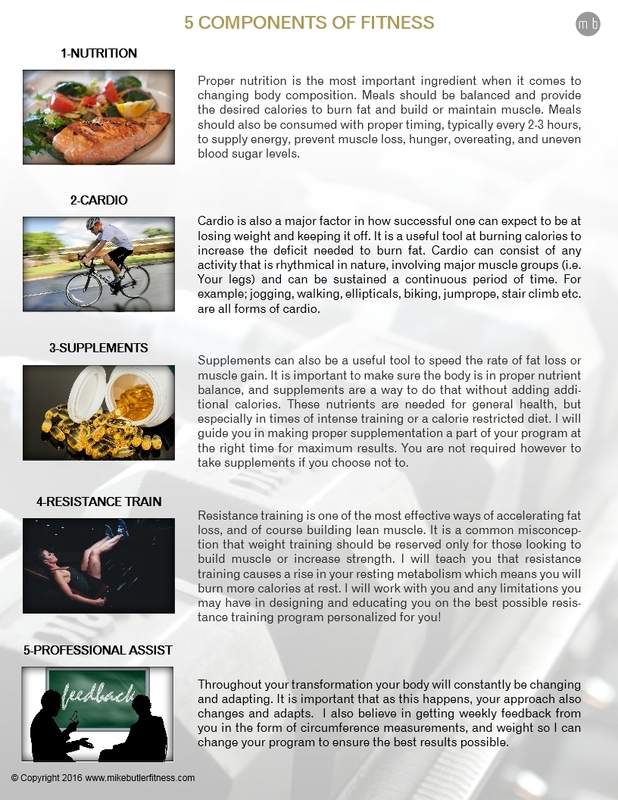 Proper nutrition is the most important ingredient when it comes to changing body composition. Meals should be balanced and provide the desired calories to burn fat and build or maintain muscle. Meals should also be consumed with proper timing, typically every 2-3 hours, to supply energy, prevent muscle loss, hunger, overeating, and uneven blood sugar levels. Cardio is also a major factor in how successful one can expect to be at losing weight and keeping it off. It is a useful tool at burning calories to increase the deficit needed to burn fat. Cardio can consist of any activity that is rhythmical in nature, involving major muscle groups (i.e. Your legs) and can be sustained a continuous period of time. For example; jogging, walking, ellipticals, biking, jumprope, stair climb etc. are all forms of cardio. Throughout your transformation your body will constantly be changing and adapting. It is important that as this happens, your approach also changes and adapts. I also believe in getting weekly feedback from you in the form of circumference measurements, and weight so I can change your program to ensure the best results possible.